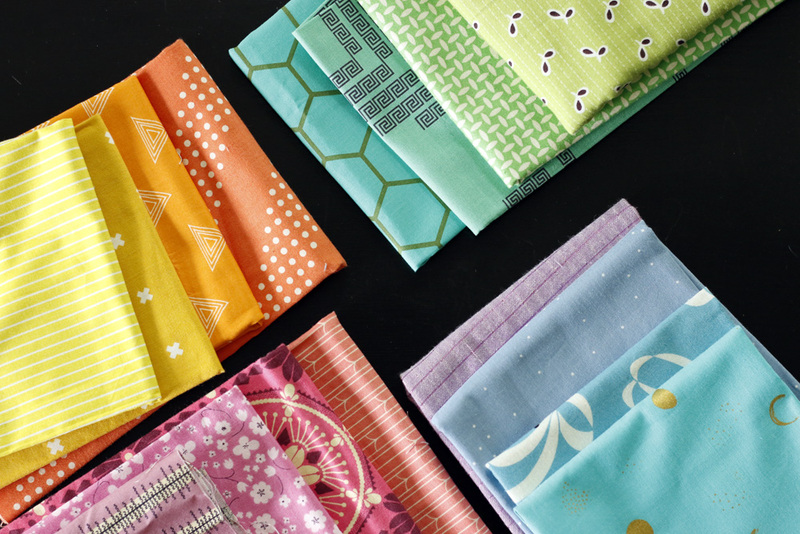 A few weeks ago I picked out an assortment of fabrics for a new color wheel quilt. I wanted to re-visit the project with soft, pastel colors. At least, these are my sort of pastels. It still needed to feel like a rainbow! A springtime rainbow. The project waited while I ordered backing fabrics from Lark Cottons. Those tigers are my best friends, ya know. I like to make up this quilt with a gray or black background fabric, thrown in for contrast. That was the perfect excuse to finally get some Blueberry Park yardage. The pewter is a soft shade of gray that I never seem to stash. Well, what makes a day even better (yes, even better!) is when you're able to start and finish the piecing all in one afternoon. The quilt top really did come together that fast! It's very little piecing for such a big impact. Now I'd better start thinking of a backing. If you're drawn to this design, keep in mind that Wheel Quilt is one of many projects included in Curves Class. Registration for class will open on Monday, April 2nd. The class runs April 16 - May 18th. You'll learn how to sew precise curves, like these, as well as improv curves. This particular project, Wheel Quilt, even teaches you how to draft pattern pieces for a precise curve using simple measurements (not on the computer). For more details on Curves Class, hop over to this post. Let me know if you have any questions. Well, I'm having a much better week than last. Thank goodness! Hope your week is shaping up nicely as well.